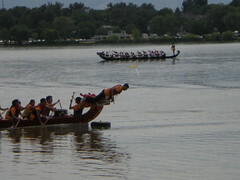 On July 26th, Dennis & I went to the Dragon Boat Festival at Sloan’s Lake. 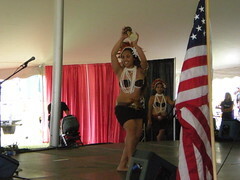 We were there with thousands of other people-enjoying a fairly low key cultural event. 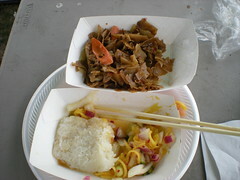 The food vendors were lined up, happy to serve up various Asian fares. We had Thai for lunch, it was good quality for the quantity made-IMO. Here in the picture is Mango Noodle Shrimp (served cold), wide rice noodle chilli dish, and sticky rice. After lunch, we watched some boat races, but we couldn’t really make out what was going on…so we walked over to where the racers were queing up. One of the race coordinators explained the ins and outs of Dragon Boat Racing. The primer helped us to get a handle on the excitement of the races. 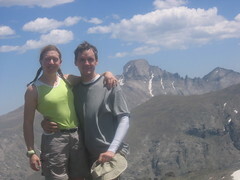 Dennis & I hiked to the top of Hallet’s Peak (above) via Flattop Mountain (Below). The 10 mile hike took us 5.5 hours (11:30am to 5pm) and we had about 3,400′ of elevation gain. 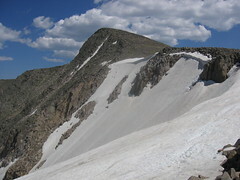 I wonder why Flattop is distinguished as a separate mountain, when it seems to me it is a plateau. 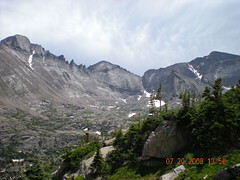 What are the USGS specifications for classification of mountains? 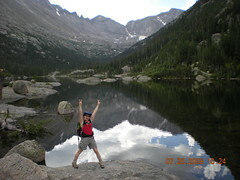 Dennis & I hiked up the Ypsilon Lake Trail, starting from Lawn Lake Trailhead, RMNP. 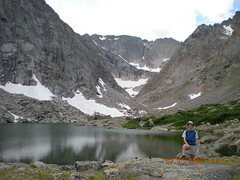 It is a moderate hike, up a ridge to a pretty alpine lake. 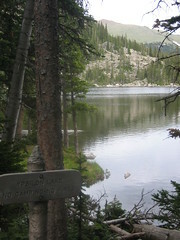 The hike is ~9 miles round trip (to Ypsilon Lake) with 2,378′ of gain. 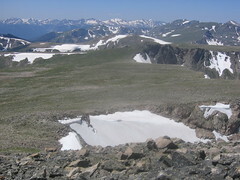 The highest altitude achieved is 10,772′. 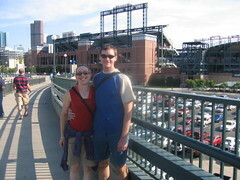 Dennis & I spent the afternoon/evening at the ballpark. 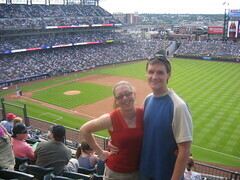 The baseball tickets were a reward for good performance on a project at work (Thank you Lockheed Martin!). The company apparently has a section of seats reserved on the third level along first base, which offer a very nice view. 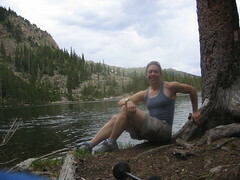 You are currently browsing the climbergirl blog blog archives for July, 2008.